I’ve been watching the TV series Father Brown (a BBC series, available on Netflix) for many months now, and it’s quite delightful. 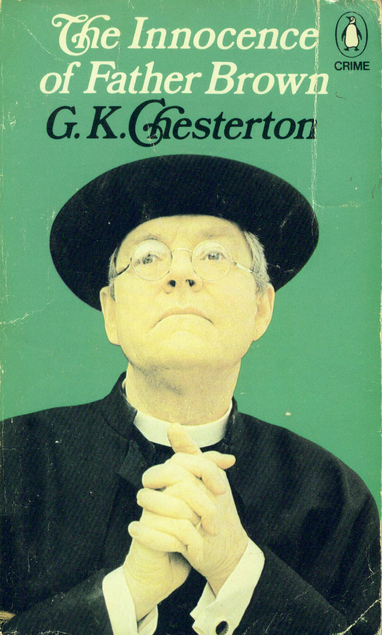 I thought I’d try the original stories, written by G. K. Chesterton, and got The Innocence of Father Brown. the first collection of short stories, from the library. It was an engaging book with some clever mysteries–though not quite the Father Brown I was looking for. Father Brown is a Catholic priest in England, with a knack for solving mysteries. Many of the short stories in this first book feature Hercule Flambeau, first as a criminal and then reformed into a detective. The setting is mostly London, I think in the late 1800s. Some of the stories relate to Father Brown’s activities as a priest, though less than you might expect. The connection is more through the insights Father Brown has gained as a priest than through plot connections. The TV show, on the other hand, moves the setting to the Cotswolds in the 1950s, where Father Brown is pastor of St. Mary’s Church. Here his parish work is much more integral to the stories, as usually some aspect of his priest work brings him into contact with the crime–nearly always murder. The TV show adds in additional supporting characters: Mrs. McCarthy, parish secretary and quite proper; Lady Felicia, local aristocracy and not so proper; Sid, chauffeur to Lady Felicia; and, in later seasons, Bunty, Lady Felicia’s very modern niece. There’s also an ongoing parade of local police chiefs, none of whom appreciate this priest interfering in the world of crime. Father Brown himself came across as much more charming in the TV show as well. Played by Mark Williams (who you may have seen as Mr. Weasley in the Harry Potter movies) he simply radiates good-natured kindness and compassion. He takes his faith–and murders–seriously, but is also very light-hearted and caring. He’s visibly motivated by the desire to protect the innocent and help everyone, even the guilty (by trying to draw them towards a better path, even though that does usually mean confessing and facing justice for their crimes). He makes much out of caring for his “flock,” his parishioners, and is always riding around the Cotswolds on his bicycle, with his hat and umbrella. The Father Brown of the short stories did not seem quite so good-natured and kind–not that he isn’t those things, but he doesn’t radiate them the same way. He’s seeking answers and justice and possibly repentance, but the visible compassion was not so strong. He seemed at times almost too intrigued by the puzzle of the crime (a la Sherlock Holmes, actually), and sometimes deliberately obscure. Chesterton didn’t want to reveal the answer yet, so Father Brown speaks evasively, but it comes across as a kind of tease. 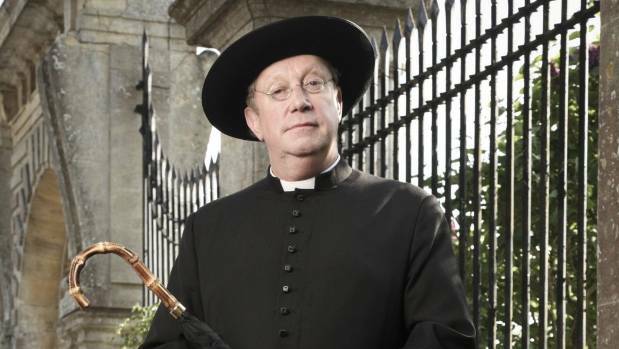 The TV show also seemed to build more on the fact of Father Brown being a priest. A lot is done with confessions–Father Brown knows someone is guilty or innocent because of what they tell him in confessional but, because of the Seal of the Confessional, he can’t tell that information to anyone. There was one particularly clever episode where a woman told Father Brown in confession that she was plotting to murder someone, so Father Brown had to try to prevent the murder without being able to tell anyone that he knew it was going to happen. I did like the Chesterton short stories–but I love the TV show. I will probably read at least one more volume of Chesterton and see how it goes, as sometimes authors took a little time to really get into the style of their character, and the first volume might not be entirely representative. We’ll see. It’s a bit funny that I waited until I had watched all five seasons of Father Brown before I read Father Brown the book, thinking they’d be too similar to do concurrently. Then they really weren’t, and instead the book made me want to watch the TV show…and, happily, season six came out just a couple weeks ago and I’m watching that now! I’ve seen many episodes of the TV show, too. Haven’t read the books at all. I agree with your evaluation of the show and Fr. Brown’s character. The stories are engaging but, as you pointed out, it seems a little odd to have so many murders in such a bucolic location. :). You have to suspend disbelief I guess in favor of each story. I’ve enjoyed seeing a Catholic priest portrayed each week in such a positive light. Would definitely recommend the series.